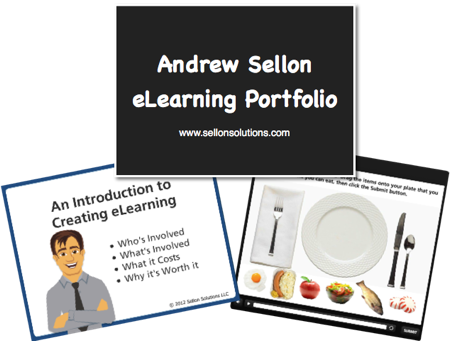 Check Out My eLearning Portfolio Right Here On My Web Site! David Anderson, that clever devil also known as Community Manager over at the Articulate Forums, has gotten me hooked on his eLearning Challenges. Time doesn’t always permit me to join in, but I did last week, and here I am again this week. Maybe it’s the start of a trend. This time the challenge was to publicize our eLearning portfolios. Well, sure–why not! While the content I create for my clients is always proprietary and cannot be shared online, I have created a few sample eLearning treats for you to experience, explore, and enjoy on the eLearning Samples page of my web site. I’m always adding new items when my schedule allows, so if you haven’t checked it out lately, see what you think, and let me know! An eLearning Portfolio is an organic, ever-changing thing. In addition to providing access to our portfolio, each of us was asked to create appropriately sized graphics to advertise our work, and to post them on the media we use. I’m not currently a Pinterest user, but I created my graphic, posted it on David’s Facebook link, and I tweeted it on Twitter. I had to laugh at the number of us in the Forum group who have been wanting to get around to this little bit of shameless self-promotion for some time–but real life projects tend to get in the way. It took David’s challenge to spur us into action. And luckily a bunch of us were able to take up the challenge this time. It’s great to see all the different styles of portfolios people have created, many of them like me using Articulate Storyline for the samples. You can read about the challenge on the forum by clicking here. Thanks for another great (and very useful) challenge, David!